Jair Bolsonaro’s ascent to the presidency of Brazil signaled a dangerous escalation of fascism’s worldwide inroads. No sooner did he take office than he raised the specter of genocide with a number of decrees attacking Indigenous peoples, women, human rights and environmental health. Part of theBrazilian Rainforest near Manaus. Photo: Widipedia. On his first day Bolsonaro ordered the human rights ministry to cancel any protection for LGBTQ people. Earlier he attacked “gender-based ideology,” saying it was a threat to Brazil’s “Christian values.” His foreign minister calls for an alliance of the “three biggest Christian nations”: Brazil, Putin’s Russia and Trump’s USA. Such attacks will no doubt continue. He has already vowed to crush the Workers’ Party. He speaks of eliminating the “communists,” whoever they may be. High on Bolsonaro’s list of targets is the MST (Landless Workers’ Movement)—the largest social movement in Brazil—who for decades have organized peasants to fight for land, including carrying out land seizures. He has spoken of them as “scoundrels.” His secretary of land affairs—Luiz Antonio Nabhan Garcia, president of the Democratic Association of Ruralists, a group of right-wing farmers and activists opposed to land reform—said that he would not “negotiate” with landless peasant movements. Violence against different social movements is certain to increase with more Brazilians buying arms. Brazil is already the world’s deadliest country in sheer numbers for Indigenous, land, and environmental activists. 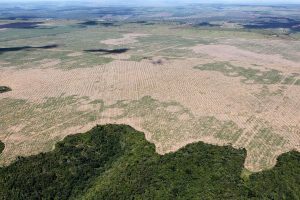 Another act of Bolsonaro moved the Brazilian Forestry Service, which promotes the sustainable use of forests, out of the Environment Ministry to be under the control of the Agriculture Ministry, which will become the management unit for public forests. 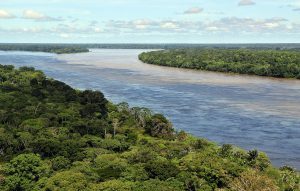 All this further threatens the Amazon. Deforested Brazilian Rainforest. Photo: Widipedia. The world’s largest rainforest, having sustained devastating destruction for decades under neoliberal governments—with some respite, but not enough, during the “progressive” Workers Party governments—primarily through illegal logging and conversion to farmland, will now be subject to even more intense government-sponsored attack. Parts of Brazil are certainly dangerous places with too much crime, gangs and drugs, often with police complicity. But militarization and more militarization will only make things worse. What will it mean for the poor and Black youth in Rio’s favelas? Bolsonaro’s long history of association with and admiration for the military—including his fondness for the two-decades-long military dictatorship, 1964-1985—will mean a Brazil under the bootheel of Bolsonaro’s fascism, and a strengthening of capitalism’s global turn toward fascism. This entry was posted in Articles and tagged Brazil, Brazilian Forestry Service, capitalism, Christian nationalists, Dinama Tuxa, environmental regulations, Eugene Walker, fascism, favelas, Indigenous people, Jair Bolsonaro, landless workers movement of Brazil, lgbtq movement, Luiz Antonio Nabhan Garcia, Marxism, rainforest. Bookmark the permalink.